ReplicaManager manages log replicas using the LogManager. 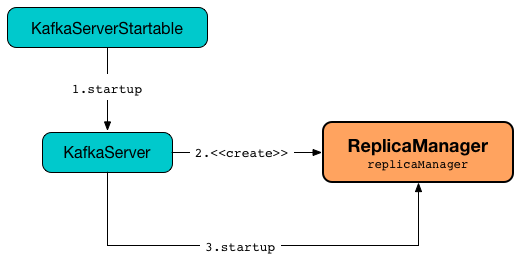 ReplicaManager is created and immediately started when KafkaServer is requested to start up. ReplicaManager is given all the required services (e.g. 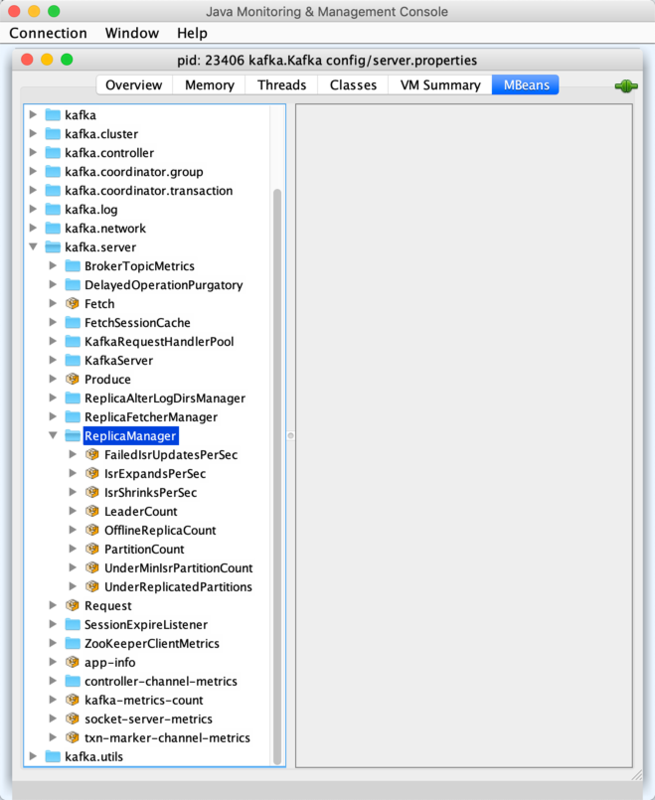 Metrics, KafkaZkClient, Scheduler, LogManager, QuotaManagers, MetadataCache) from the KafkaServer. KafkaServer creates a ReplicaManager for the only purpose of creating KafkaApis, GroupCoordinator, and TransactionCoordinator. When started, ReplicaManager schedules isr-expiration and isr-change-propagation recurring tasks (every half of replica.lag.time.max.ms property and 2500 ms, respectively). ReplicaManager is a KafkaMetricsGroup and registers performance metrics. The performance metrics are registered in kafka.server:type=ReplicaManager group. Time when isrChangeSet has a new TopicPartition added. Enable TRACE logging level for kafka.server.ReplicaManager logger to see what happens inside. That means that the logs of ReplicaManager go to logs/state-change.log file at TRACE logging level and are not added to the main logs (per log4j.additivity being off). createReplicaFetcherManager simply creates a ReplicaFetcherManager. createReplicaFetcherManager is used exclusively when ReplicaManager is created. alterReplicaLogDirs is used exclusively when KafkaApis is requested to handle an AlterReplicaLogDirs request. becomeLeaderOrFollower is used exclusively when KafkaApis is requested to handle a LeaderAndIsr request. makeFollowers is used exclusively when ReplicaManager is requested to becomeLeaderOrFollower. recordIsrChange adds the input topicPartition to isrChangeSet internal registry and sets lastIsrChangeMs to the current time. updateFollowerLogReadResults is used exclusively when ReplicaManager is requested to fetch messages from the leader replica. fetchMessages is used exclusively when KafkaApis is requested to handles a Fetch request. maybePropagateIsrChanges is used exclusively when isr-change-propagation task is executed (every 2500 milliseconds). ReplicaManager initializes the internal registries and counters. startup then creates a LogDirFailureHandler and requests it to start. startup uses Scheduler that was specified when ReplicaManager was created. maybeShrinkIsr requests the partitions (from allPartitions pool that are not offline partitions) to maybeShrinkIsr (with replicaLagTimeMaxMs property). maybeShrinkIsr is used exclusively to schedule isr-expiration recurring task when ReplicaManager starts up. makeLeaders is used exclusively when ReplicaManager is requested to becomeLeaderOrFollower. describeLogDirs is used exclusively when KafkaApis is requested to handle a DescribeLogDirs request. handleLogDirFailure is used exclusively when LogDirFailureHandler is requested to do the work. maybeUpdateMetadataCache is used exclusively when KafkaApis is requested to handle an UpdateMetadata request. For every partition in the given entriesPerPartition, appendToLocalLog gets the partition (or throws an exception) (with expectLeader flag enabled) and then request the Partition to appendRecordsToLeader. appendToLocalLog is used exclusively when ReplicaManager is requested to append records. getPartition gets the partition for the given TopicPartition. stopReplica is used exclusively when ReplicaManager is requested to stopReplicas. underReplicatedPartitionCount is used exclusively for the UnderReplicatedPartitions performance metric. leaderPartitionsIterator is used exclusively for the performance metrics: LeaderCount, UnderMinIsrPartitionCount, and UnderReplicatedPartitions (indirectly using underReplicatedPartitionCount). nonOfflinePartitionsIterator is used when ReplicaManager is requested to leaderPartitionsIterator, checkpointHighWatermarks, and handleLogDirFailure. getOrCreatePartition is used exclusively when ReplicaManager is requested to becomeLeaderOrFollower. stopReplicas is used exclusively when KafkaApis is requested to handle a StopReplica request. localReplicaOrException finds the partition (or throws an exception) for the given TopicPartition (and expectLeader flag off) and requests the Partition to get the local partition replica (or throw an exception). A partition replica is local when the replica ID is exactly the local broker ID.